The internet has a long-lasting love affair with cats, especially those fat ones who provide a constant source of entertainment. While we all may chuckle, giggle and even ROFL at their antics (or predicaments), obesity is really no laughing matter. Overweight and obese cats are at risk for serious health conditions — ranging from diabetes to urinary tract diseases to lameness and arthritis — and even a shortened lifespan. Read on to learn more about the connection between excessive weight and these conditions. The health problems associated with overweight pets are seen almost daily in American veterinary clinics. For cats, diabetes is the health problem with the strongest link to obesity. Compared to optimal-weight cats, overweight cats are twice as likely to develop diabetes, while obese cats are four times as likely to develop this second-most-common feline endocrine (hormonal) disease. A combination of insulin resistance and decreased insulin production contributes to feline diabetes. Insulin resistance occurs when the body’s cells don’t respond normally to insulin, the hormone that’s necessary for cells to take in glucose (blood sugar) from the bloodstream. Not only does insulin resistance contribute to diabetes, it is also thought to play a role in other diseases, such as kidney disease, liver disease and cancer, and to contribute to ongoing obesity. In a survey of private veterinary practices, obesity was shown to be a risk factor for lower urinary tract disease in cats, presumably as a result of inactivity and infrequent urination. Even more importantly, however, may be the effects of obesity on a cat’s kidneys. Although studies in cats are needed, research in both people and dogs have found that obesity can change kidney function. 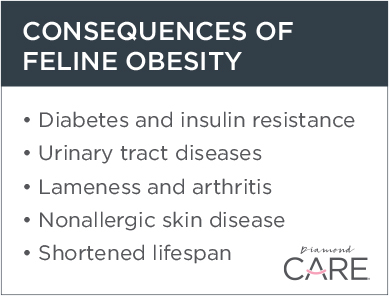 In fact, recent studies in people show obesity is an important risk factor for chronic kidney disease independent of diabetes or high blood pressure. Compared to cats kept at an optimal weight, obese cats are almost five times as likely to develop lameness, presumably due to arthritis and soft tissue injuries, that requires veterinary care. In addition, heavy cats are almost three times more likely to develop lameness not associated with bite trauma. As in dogs and people, how obesity contributes to lameness isn’t fully understood, but it may be related to increased force and stress on joints. A low-grade inflammation that’s associated with obesity may also contribute to joint pain. Obese cats are more than twice as likely to develop nonallergic skin conditions as cats fed to maintain an optimal weight. The skin issues seen in obese cats include increased dandruff and a dry, dull coat, especially over the rear part of the body, and are thought to occur as a result of decreased grooming. Although obesity in cats is easier to prevent than to treat, it can be reversed and managed through a weight-loss program. The first step is recognition of the problem. Your veterinarian can help determine if your feline friend is overweight or obese using a combination of body weight and body condition score. Once an excessive weight problem is recognized, you and your veterinarian can create a plan that works for you and your cat. Cats that lose weight rapidly are at risk for developing fatty liver disease (aka hepatic lipidosis), so be sure to discuss any weight management efforts with your veterinarian before starting your cat on a diet. Provide a consistent diet by monitoring the amount of food you feed your cat and practicing appropriate feeding. Avoid feeding table scraps to your pet. Limit the amount of treats you give to no more than 10 percent of daily calories. Establish a healthy and fun exercise schedule that includes options for play while you’re away from home during the day. The term “fat cat” isn’t a good thing when it comes to your feline companion’s body condition or weight. Veterinarians agree that overweight and obese cats are at greater risk for serious health issues that ultimately can lead to a decreased quality of life and a shortened lifespan. The good news is that obesity is preventable, even reversible, and doesn’t need to take a toll on your cat’s life.